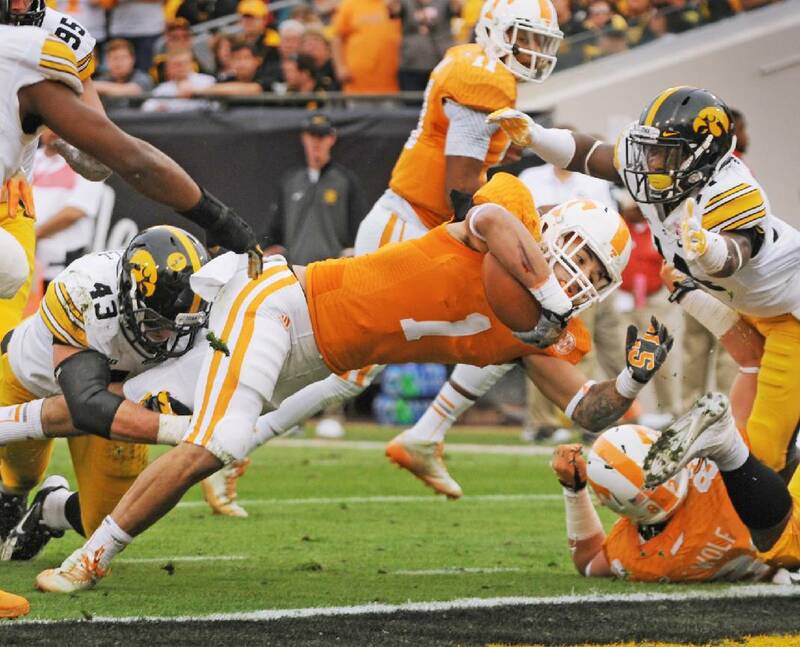 KNOXVILLE -- Tennessee will have a bigger and more determined Jalen Hurd to hurl at SEC defenses this season. That has many of his teammates and coaches excited for what's ahead. After leading the Volunteers in rushing as a freshman in 2014, Hurd focused on adding weight to his 6-foot-3 frame this offseason, and he's entering the season at 240-plus pounds. More importantly, though, Hurd appears to be more driven and hungrier than ever. "You can tell he's really locked in and ready to go, ready to do everything he can this season to get us where we want to go," starting guard Jashon Robertson said after Friday's practice. After playing in the 225- to 230-pound range in 2014, Hurd said he "just worked really hard" and stuck to a strict eating routine to add about 15 pounds, which should help him better handle the wear and tear that comes with being a big running back in big-time college football. 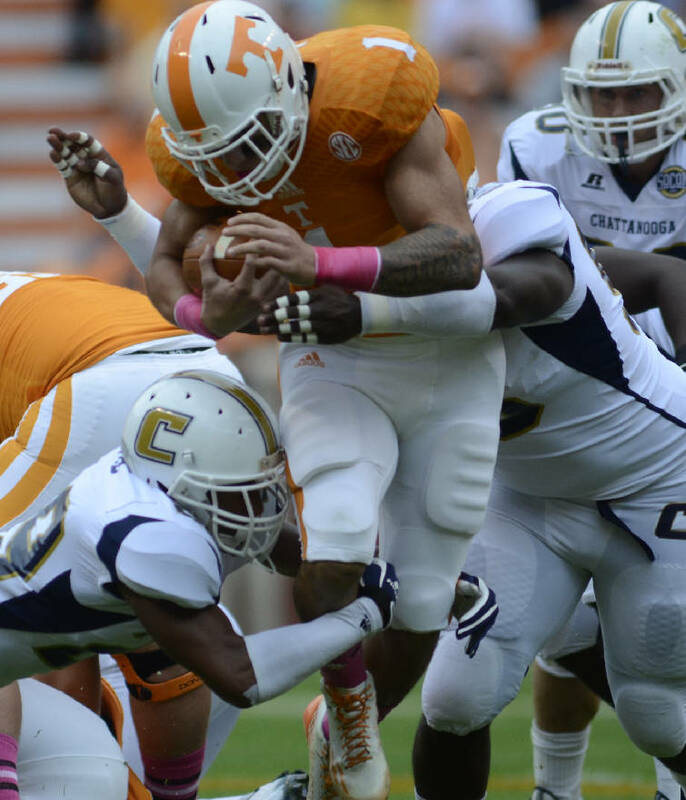 UT's Jalen Hurd is tackled by UTC's Lucas Webb, right, and Josh Freeman Saturday at Neyland Stadium. Hurd insists he's not lost any of his speed, but since he's more of a power back, the extra pounds and muscle should help him generate more power and dish out more punishment to defenders. "I feel more explosive," he said. "Being bigger, I can take more of an impact. I'll be more durable during the season." Those are welcome words for the offensive linemen who will be blocking for Hurd. "I love the fact that we have a 240-pound running back. It makes my life a lot easier. As long as he doesn't hit me in the back, we're all good." Tennessee struggled offensively when it didn't have Hurd in the backfield last year, most notably against Florida and Vanderbilt. Though newcomer Alvin Kamara should help take the load off Hurd, Tennessee will feel much better about its chances of having a big season if No. 1 is lining up in its backfield. The Vols already feel pretty good about the way he's handling himself entering his sophomore season. On multiple occasions this offseason, head coach Butch Jones has made note of a more-determined Hurd, and others are echoing that early in the preseason. "He's doing a lot of the same things he's been doing," said Robertson, one of Hurd's longtime friends. "I'm glad to see him get up to 240," the sophomore added. "That's been one of his goals for a long time. Since we've been young he wanted to get up to that size and that weight, and it's worked out real well for him. He's going to be a back that's going to always fall forward. That helps us a lot. "Also in protection, if a three-technique loops around or an end loops around, he comes through and chips a guy. A lot of (backs) don't want to do that, but you see him do that and he's enthusiastic about it. We talk about it at home all the time. It's definitely an inspiration when you've got a back that's doing things like that. "You want to block for him; you want to grind for him every day." First-year offensive coordinator Mike DeBord cited an example from one of Tennessee's early practices as proof of a hungrier Hurd. "He's been outstanding in training camp," DeBord said Thursday. "The other day we had a play in pass skeletal. He was just blocking. He just went up to block, and his guy didn't come. Most guys will take off in a jog or whatever. He took off in a dead sprint to get down the field to get what we call a body on a body, getting a block. "His effort's been outstanding, and his leadership has been great." Hurd believes he's more knowledgeable about defensive schemes, but he was quick to note there are multiple areas he can improve between now and the start of the season. "You can never get a big head in this game," he said, "because there's always somebody that's going to be pushing you to be better." In Hurd's case, the main somebody is himself.